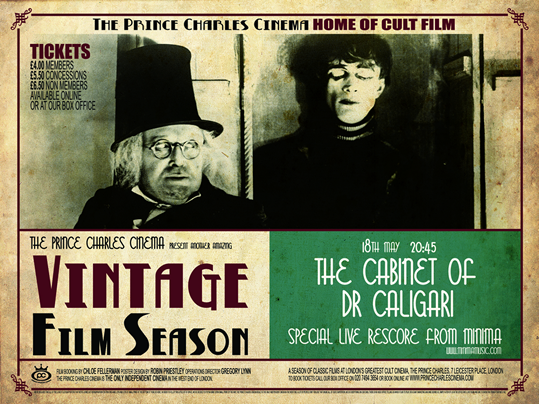 (Visit London, 30 April 2010) Murder, mysticism and eerie music – the screening of 1920s silent film The Cabinet of Dr Caligari at Greenwich Picturehouse on Wednesday night had it all. The live rescore came courtesy of music maestros Minima. I had expected a tinkling piano, so was delighted by their electrifying mix of drums, base, cello and guitar. Celebrated as a classic of German expressionist cinema, the film makes good use of menacing shadows, agitated characters and bulging eyes ringed in thick make-up – even for the men! The strange story centres around the sinister Dr Caligari who tours fairgrounds with his ‘exhibit’, a hypnotised sleepwalker called Cesare who “knows the past and can see into the future”. Alternately hilarious and mystifying, I found the film a fascinating change from today’s slick flicks, with its slow-building story, flimsy stage sets and descriptive title cards. Minima’s score was fantastic. I loved the exotic African-style drumming that accompanied Dr Caligari’s fairground show, the slightly sleazy background music for a bachelor pad and the well-timed drum beat that made me (and half the audience) jump out of our seats! Minima are sadly coming to the end of their performances of The Cabinet of Dr Caligari, but they have one more show in London at The Prince Charles Cinema on 18 May. You can also keep an eye out for more Minima performances on their website.